Sir Francis Willoughby began to build his new hall in 1580, and it was eight years before it was completed. Much of the land had already been enclosed, first in 1492 as a park for wild animals - deer and wild white cattle occupied the land and the bulls were hunted - and a further 100 acres in 1510. Much of the money for its construction derived from the wealth acquired by the Willoughby's from early coal mining in the area. The stone was brought from Ancaster in exchange for coal, and the total cost of the building reached 'about £8,000. The Willoughby family did not recover from the expense for two generations. Robert Smythson, who had previously worked at Longleat and ten years later was to design Hardwick Hall, was the 'architector and surveyor'. The Hall was designed for show rather than comfort. The Elizabethans were fascinated by pattern and symmetry and the design shows both of these, reflecting ideals of the late Renaissance period. The square plan of the building was originally intended to be set off by symmetrical gardens and outbuildings on all sides. The Hall has an unusual plan, with a high central hall which has windows 35 feet above the floor. The main rooms are set around it on both floors, mainly opening out of each other as the plan leaves little room for corridors. On the first floor were two state bedrooms, the north and south great chambers. These were connected by the passage above the screen in the hall, and were provided in case of royal or important visitors. After being used by Queen Anne, wife of James I, and Prince Henry, they became known as the Queen's Chamber and the Prince's Chamber. The whole of the east side of the first floor was originally a long gallery. Each corner tower has a small room on each of the three floors. Above the central hall is a large room known as the 'Prospect Room', This commands a splendid view over the countryside, but has the disadvantage of being reached only by narrow spiral staircases, It was at various times used as a ballroom, or as dormitory accommodation for guests' servants, when it was known as 'Bedlam'. The windows are large, though not quite as large as those of the later Hardwick Hall, and the basement kitchens and service quarters are unusually well lit, as the raised ground floor allowed windows to be provided above ground level for them. Below the basement is a series of subterranean passages used as wine cellars and for storage, partly lined in 17th century brick; there is also a well of ice-cold pure water and a reservoir known as 'The Admiral's Bath' (perhaps after Rear-Admiral Sir Nesbit Willoughby. The interior of the main hall was comparatively plain: paintings hung beneath the high windows, and above was a hammer-beam roof. At the west end of the hall was an ornate stone screen, above which an organ was later to be placed. The main staircase, to the left of the entrance hall, was decorated in about 1680 with wall and ceiling paintings. These have classical themes as was then fashionable, and include portraits of members of the family. In 1642 two sides of the house were damaged by fire, which did not damage the structure. The following year, during the civil war, parliamentarians occupied it briefly as a deterrent to threats by Royalist troops. The Hall was then left empty until 1687 when Francis and his sister Cassandra Willoughby moved in and started to redecorate it. In 1801 and 1823 the 6th Lord Middleton employed Jeffry Wyatt, later Sir Jeffry Wyatville, to repair and remodel the Hall. Although he destroyed much of the picturesque old woodwork he made the house much more comfortable, adding the servants' hall and other domestic areas on the west side and solving the problem of chimneys by making a crown of chimney pots on each turret. He also restored the roof and the stonework on the west side of the building. 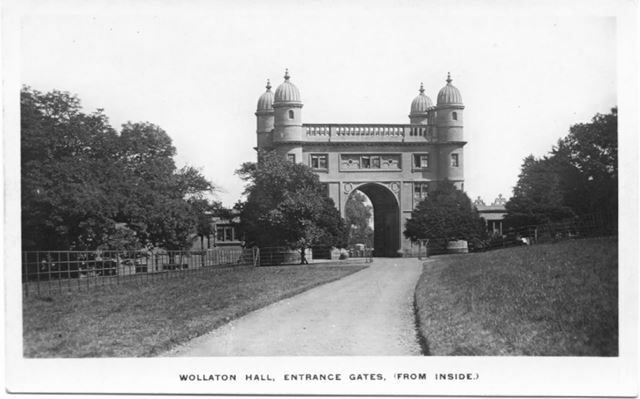 The Beeston and Lenton gatehouses were designed by Wyatt in 1823~24, and he probably also designed the camellia house which was also built in 1823. The camellia house is said to have cost £ 10,000 including £ 1400 for the rare plants - an enormous sum at that time. It is the first known example of building in prefabricated cast iron and glass. The stables and other outhouses date from the end of the 18th century. The date when the lake was made is not known, but it was probably also in the 18th century - it appears on the 1835 map, and was formed with water supplied by Tottle Brook. The City Council took the decision back in 1924 to buy Wollaton Hall and surrounding parkland from the 10th Lord Middleton who had recently inherited the Wollaton Estate from his brother and decided that the hall and grounds were surplus to requirements. He offered them to the City Council for the sum of £200,000. (In 1921 the 9th Lord Middleton had turned down an offer from Jesse Boot who had put in an offer to purchase the hall and land as he was considering it as a possible site for Nottingham's University College.) After the Council's purchase, land at the eastern side of the park was given over for an estate of 'small working, class houses' and from September 1925 onwards, individual plots of land along the northern and southern edges of the park were sold off to private builders. The Council wanted 'quality' housing here and set lower limits to the price of any houses built on these plots. On the Wollaton Road sites it was £700 while in the Adams Hill area of the Derby Road the sum was £3,000. With the sale of this building land the Council recouped the entire cost of their initial purchase; which makes it clear just how generous Lord Middleton had been when he sold the Hall and grounds to the City. The Council also took the opportunity to construct a new highway between Wollaton Road and Derby Road; calling it Middleton Boulevard. The Council soon decided that a portion of the grounds should be turned into a golf course and the remainder should be retained as a public park, with the hall becoming a natural history museum. (Approximately 500 of the original 800 acres of parkland were eventually set aside for the public park and golf course.). The Hall is popular today with visitors (the stuffed giraffe and Gorilla's 'private parts' are lodged in most Nottingham children's memories!). The 18th Century stable block is home to the Industrial Museum and Visitor's Centre. The extensive parklands are great for playing and exploring, with a Sensory Garden, a large lake, two playgrounds and deer roaming in the park.